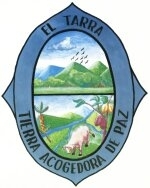 Flag and Coat of Arms at <eltarra-nortedesantander.gov.co>. Translated from this site: "It is composed by two horizontal stripes, of equal width. The first stripe is blue, and the second, green. The blue means the atmosphere, that covers the Catatumbo Region, source of pure oxygen and life; and the rivers that extends in the territory: Catatumbo, Tarra and Orú giving fertility to this lands. The green means the extensive and thick jungle of the Catatumbo that characterizes this zone. Also means the temperance, the innocence, the piety, the sweetness, the happiness, the perseverance, the reward and the loyalty. Also it is the color of the near mountains."